This past Saturday the Flyers clinched a playoff berth becoming the third team in the Atlantic Division to do so this season. The franchise is looking to reach the Stanley Cup Finals for the second time in three years, and hopes to win its first Cup since Bernie Parent and Bobby Clarke carried them there back in 1975. While the team is going to need significant efforts from the entire team, and also find a surprise player who makes a huge impact, these are the ten guys who I think are going to need to play their best hockey from April to June. Talbot’s season has been one of the many pleasant surprises the Flyers have had this year. Pittsburgh’s 2009 Stanley Cup hero put up decent offensive numbers last year contributing 8 goals and 13 assists, something Flyers fans would have been happy with as long as he also did what he was brought here to do, be a glue guy in the locker room and a penalty kill specialist. Nobody was expecting Talbot to pick up 18 goals and 11 assists at this point in the year. Talbot is going to have to continue this pace if he wants to be playing hockey in June. Talbot’s line with Sean Couturier and Jakub Voracek has been crucial lately in shutting down the top lines of opponents. He will be relied on to score some goals in clutch situations, jump in front of a slapshot on the penalty kill, and not afraid to drop the gloves (something he did that dramatically changed the series in the first round of the 2009 Flyers Penguins series). Kubina has only played in 10 games for the Flyers but he is going to be crucial to this team making a run. Brought in to help fill the hole left by injured captain Chris Pronger, Kubina and his powerful righthanded blast from the blue line are going to be even more important now that Andrej Meszaros is going to be out likely until sometime in May. When Pronger went down, this team was missing a big hulking presence at the defensive end of the ice, a role Kubina is going to fill. Without the nastiness of Pronger back in 2010, the Flyers probably don’t make it to the finals. His presence was greatly missed last year and led to an early exit. While Kubina is not Chris Pronger, the nastiness he brings out on the ice with him is very similar to what Pronger would do. All 6’4 258 pounds of Kubina will not be afraid to get in somebody’s face and keep them away from the net. Recently, the defensive pairing of Braydon Coburn and Nicklas Grossmann have been used as the Flyers’ shutdown defenseman. The way things are looking now, they are still going to be on the ice going against guys like Sidney Crosby, Evgeni Malkin, Brad Richards, Alex Ovechkin, and Tyler Seguin. Prior to the acquisition of Grossmann, Coburn had been playing alongside Kimmo Timonen for about the last four and a half seasons and were arguably the Flyers’ best pairing. The play of Coburn has gone relatively unnoticed by members of the national media, but those in Philadelphia know just how important he is to this team, see the four year $18 million contract extension he inked back in November. Coburn has shown over the past few years just how smart he can be in the playoffs. Last year, when the Buffalo Sabres’ Patrick Kaleta had Timonen lined up for a boarding call, Coburn came in, took out Kaleta, and took his two minutes in the box while protecting one of the team’s key assets. Smart plays like that are going to help this team win the cup. Last year in the two series against the Buffalo Sabres and Boston Bruins, James van Riemsdyk put on one of the most dominating performances I have ever witnessed. Whenever he had the puck he did whatever he wanted to do with it, the second year forward was the best player on the ice at all times. Over the summer, the Flyers rewarded that performance with a 6 year $25.5 million extension. Early in the year it looked like that performance was going to carry over to this year, but then injuries started to take their toll on van Riemsdyk and only allowed him to compete in 43 games this year. After blocking a shot and breaking his foot on March 1st, van Riemsdyk has been rehabbing from surgery and should be ready to return by the first round of the playoffs. While we don’t know what kind of production to expect out of van Riemsdyk, the Flyers need him to make a run. While Eric Wellwood has done a great job filling in since van Riemsdyk went down, he is not the same player van Riemsdyk is when healthy. If he can regain some of the swagger he had in last year’s playoffs, he could be a candidate for the Conn Smythe Trophy down the stretch. The biggest surprise of this season has been the play of Scott Hartnell. Hartnell leads the team with 35 goals and has been their MVP in my opinion. The gritty Hartnell is going to need to carry over that performance and still be that same annoying player on the ice he has always been. Hartnell can get inside the head of Evgeni Malkin like no other. Hartnell has a tendency to have his insults picked up by microphones and during HBO’s 24/7 series leading up to this year’s Winter Classic could be heard calling Malkin the ugliest player in the league and everybody knows about Malkin’s tendency to take dumb penalties when he gets annoyed. Malkin hasn’t been his only target, he also bugs Zdeno Chara and Dion Phaneuf every time the Flyers matchup with the Bruins or Maple Leafs respectively. This type of player is invaluable in the playoffs as special teams can tend to win and lose you games. The more time the Flyers spend on the powerplay, the more goals they are going to get. It’s that simple. Hartnell is going to be out there to score goals, draw penalties, and stick up for linemates Claude Giroux and Jaromir Jagr. When that line is performing at it’s best, this team wins. They will be crucial in the playoffs. Speaking of Jagr, he’s next on this list. Jagr not only brings with him some of the most talent on this team and one of the best work ethics, but he’s also got the experience of winning a Stanley Cup, something that cannot be underestimated in a locker room full of rookies and other young players. Only seven players remain from the Flyers run to the finals two years ago so the experience Jagr brings with him is huge. Not to mention that he’s been one of the best players the team has had this season. Coming into the season, Jagr was another one of the players we did not know what to expect from. He had spent the last three years playing in the KHL before deciding to return to the NHL at age 39. Everybody knows that Jagr is one of the greatest players in the history of the game currently sitting in eighth place on the league’s all time leading scorers list. Since he was signed last July, Jagr has not hesitated to talk about how much he looks forward to getting the chance to play in the playoffs. That’s what makes me think we have not yet seen Jagr’s best performances. I’m expecting him to resemple the Jagr of old and do whatever it takes to bring the Cup to Philadelphia in June. Claude Giroux has easily been the Flyer’s best player this season picking up 27 goals and 59 assists amidst a career year. Giroux’s play has thrown his name into contention for the Hart Trophy along guys like Malkin and Henrik Lundqvist. Getting the chance to play with Jagr I think has been crucial to the development of Giroux, to be a budding superstar getting the chance to play alongside one of the all time greats, the hockey conversations between these have really gotta be something. Giroux is going to be relied on heavily in the playoffs. He will be out there in all situations, even strength, powerplay, and penalty kill. He cannot go into a slump if this team is going to win, he is much too important. Giroux’s emergence last season was one of the major reasons Flyers’ General Manager Paul Holmgren traded two of his best players last summer to give Giroux the chance for more ice time. Giroux has the experience of a deep playoff run, he was a key member of that team from two years ago. He know what has to be done if this team is going to succeed, he just has to go out there and continue to do it. Timonen has been Mr. Consistency since he came to the Flyers in 2007 and is probably a Stanley Cup away from being a Hall of Famer. He has been a leader on this team since he first stepped onto the ice wearing orange and black four years ago and is going to be even more important now that this team is not going to have an official captain on the ice in the playoffs. His teammates will be looking to guys like him, Giroux, Talbot, Jagr, Hartnell, and Danny Briere to provide leadership in what could be a long playoff run. Like Giroux, Timonen is also going to be on the ice in all situations and will be very important at both ends of the ice. You know exactly what you are going to get from Timonen night in and night out, he is willing to do whatever it takes to win. He is a true warrior, I don’t think he has played at 100% health at any point in his Flyers career but still managed to play in 248 straight games, a streak that was broken earlier this month. If the Flyers are going to win, Timonen has to be on the ice. Since the lockout, Danny Briere has been one of the most dominant players in postseason play putting up 93 points in 91 games for the Sabres and Flyers. While he has been stuck in a scoring slump since early January, Briere’s hard work and good play finally paid off on Saturday when he scored his first two goals with a goalie in the net since his hat trick on January 7th against the Ottawa Senators. Briere is going to be the most important skater on this team for the next few months and he is going to need to play that way. Philadelphia is going to want to see his signature fist pump after goals time and time again to ensure this team’s success. Briere’s game goes to another level when the playoffs come around. He is one of the leaders in the locker room and on the ice, he’s got a nasty edge to him which has helped turn him into a fan favorite in Philadelphia. For the Flyers to win, Briere’s slump needs to be a thing of the past and he has to get his game up to that next level. In the NHL, hot goaltending wins you Stanley Cups. You need to have a guy in the back of the net who has the ability to steal a 1-0 win from the opponents. 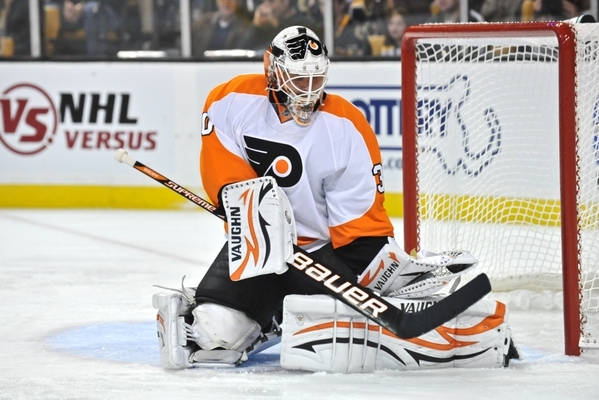 That’s the kind of guy the Flyers have had for the last month in Bryzgalov. Bryzgalov came into the month as Philadelphia’s least favorite athlete of the four major sports, what a dramatic turnaround it has been since then as Bryzgalov not only broke the Flyers record for consecutive shutout minutes, but he also appears to be a safe bet to be the NHL’s player of the month. He is finally playing like a $51 million man, and has put the team on his back for the past month. He has instilled a strong sense of confidence in himself, his teammates, and the entire city of Philadelphia. For this team to win, Bryzgalov is going to have to be the MVP for the next few months. Goaltending and the hole left by Chris Pronger doomed the team last year. The previous year, Michael Leighton was stellar in the nets until we reached the Stanley Cup Finals where his game fell apart and he has failed to stay in the NHL for an extended period of time since then. The last Flyer to win a Stanley Cup is regarded as one of the greatest of all time, if Bryzgalov keeps playing like he has recently, his name is also going to be on that list one day.